Are you curious about what to post? 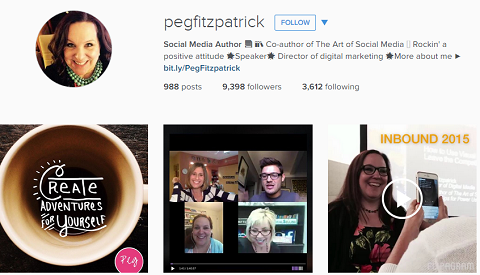 To discover how to use images on Instagram, I interview Peg Fitzpatrick. In this episode I interview Peg Fitzpatrick, the co-author of The Art of Social Media: Power Tips for Power Users, which she wrote with Guy Kawasaki. She is also a social media strategist and an expert in visual marketing. Her clients include Motorola, Audi, Google, Virgin and others. Peg will explore Instagram marketing ideas that are easy to put to use right away. You’ll discover tools to use for your Instagram images. 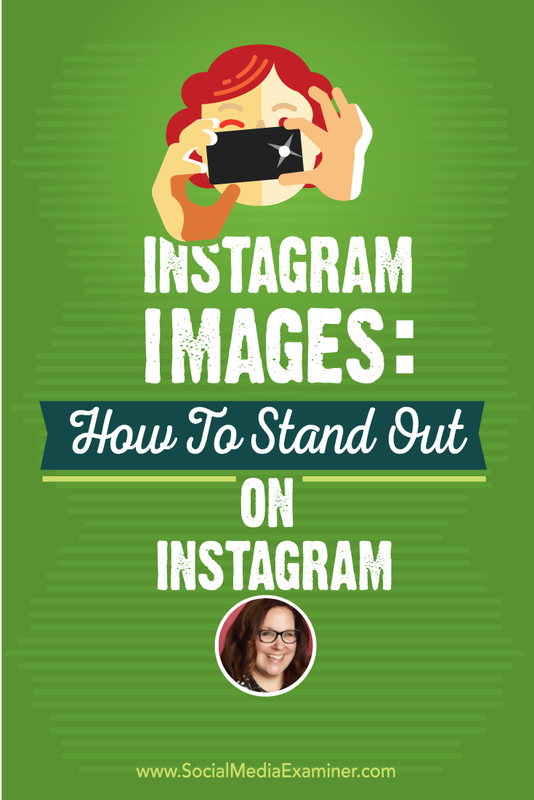 Listen as Peg Fitzpatrick shares what marketers need to know about standing out on Instagram. Peg first discovered Instagram when looking for apps for her iPad. This was shortly after the iPad first came out. She loaded Instagram and loved it, but no one she knew was on it. Then, when Pinterest came out, Peg, like a lot of people, thought Pinterest and Instagram were the same, because they were both about images. Although she initially chose to focus on Pinterest, after she learned more about both platforms, Peg discovered how different the two were. When Peg went back to Instagram, she saw it was a great place for people to have conversations. Peg was an early adopter of Instagram. Even if you know lots of people on Facebook, Peg believes Instagram is where you can build a community. As a blogger or entrepreneur, it’s the kind of place you want to go to meet new people. Listen to the show to learn about why more people didn’t get on Instagram immediately. Peg believes social media is challenging for marketers because they want to look at things in a more traditional way: how to get people to do x, y and z. The newer platforms, like Snapchat and Instagram, are even more challenging. It’s not easy to write a viral blog post or post a YouTube video that goes viral. Instagram is limited, Peg says, because you just get that one link in your bio and there are no links in the comments. While a blogger might not see the value in Instagram (“Why should my blog be on Instagram if there’s no link for people to click every day?”), brands are getting more engagement on Instagram than any other social platform. It creates brand awareness that leads more people to your business, events and products. Instagram creates brand awareness. Image: Shutterstock. The biggest mistake marketers make, Peg says, is they aren’t posting enough. On a recent panel, Peg heard Instagram people who have 500,000+ followers say they post multiple times per day. One of them posts 8 or 10 times per day. And they post excellent content. It takes more time to create an Instagram post. Although you can share a blog post immediately, with Instagram you have to create the image, write the text and figure out all of the things that go with it. On Facebook, people don’t post enough either. On Martha Stewart’s Facebook page they post every hour. Of course she probably has the biggest backlog of content of any person ever, Peg adds. 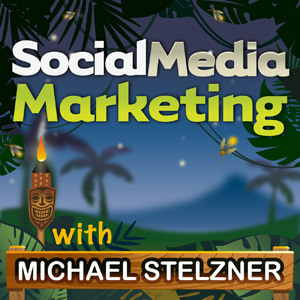 Listen to the show to discover why Social Media Examiner doesn’t do much on Instagram. Peg says there are basic things to post on Instagram, such as pictures of what you’re doing or where you are. If you’re at an event, it’s fun to post pictures of people you meet or do selfies. You can post a day in the life at your blog or business, pictures of your team or behind the scenes at your company. Show pictures of wherever you happen to be to give more of a human connection with your company. Post Instagram images at events. 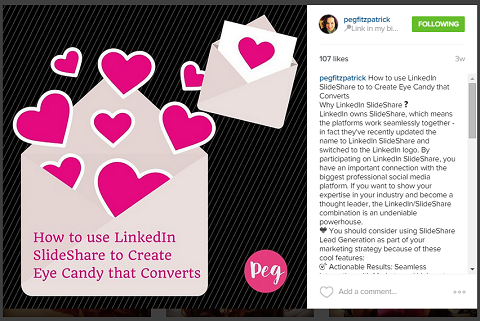 For example, Peg explains how she uses Instagram to promote a webinar before it starts to give people one more chance to click and join. She’ll share a photo of her computer monitor with something related to the webinar on it. Before a Google+ hangout, she’ll take pictures in the green room to share. She’ll either take a photo with her phone or do a picture of the screen. For example, if she’s about to do a Google hangout with Guy Kawasaki and Gary Vaynerchuk, she’ll take a behind-the-scenes photo that’s interesting and funny, and also chronicles what they’re doing. It’s part of creating and sharing your journey, as well as celebrating the things that go on. Listen to the show to hear what picture Peg posted when she was a guest at the first Social Media Marketing World. Peg explains her method for creating Instagram posts for her blog content. She creates a square image and then treats the description as a mini blog post, rather than a quick update. It’s important to give enough information in the post that people will get a sense of it and start a conversation. Start with a good image. While 640 x 640 pixels is the official Instagram biggest size, they will scale it down. You never want to have them scale images up, because that’s when they get blurry. Peg does a 735 x 735 image. Next, write an intro in the text. Peg will ask a question, add a couple of sentences and then ask a closing question. She also writes “click the link in my bio” in the description, as well as in the “location” for the photo. 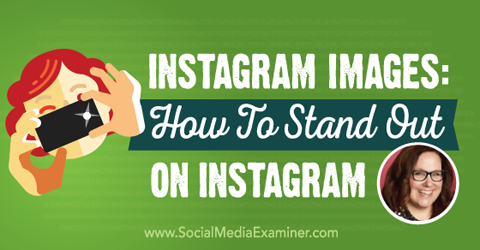 When sharing a blog post image on Instagram, Peg includes tips from the article in the description. Instagram allows you to add a location. If you’re somewhere else, that’s one thing. However, if you’re at home or in your office, you can put a call to action in the location section manually. It will save to your phone too, so you can pull it up again. Listen to the show to discover what kinds of behind-the-scenes photos we took while getting ready for Social Media Marketing World. Peg says you don’t want to build your entire Instagram marketing plan on quotes, but they really are popular. She tries to put her own spin on everything, so if she does a quote, she asks a question with it. Just make sure the content you’re sharing relates to your business goals somehow. There needs to be a reason to share it, other than to post a quote. Infographics and anything with bullet points or lists are also good. For example, on list posts, share a few tips and tell your audience to click through to read the rest. Another idea is to put multiple pictures together using a tool like Canva. If you take a bunch of photos at an event, just make a collage to share, rather than overwhelm your audience (and yourself) with tons of photos. Peg suggests branding your Instagram images. Unless you do this, when people repost your images, their audience won’t know they came from you. Include a watermark with your URL or a line at the bottom with your logo or website. Listen to the show to learn about Iconosquare and the Facebook Mentions app. Peg doesn’t take photos in the Instagram app, because they don’t save on your phone. If you take a few pictures and only share one, the others could get lost. Instead, she takes pictures in SmugMug’s Camera Awesome app for iOS and Android. It has a grid, plus you can crop and edit photos in the app. Peg doesn’t spend a lot of time editing. She’ll just take the photo and use one filter in Instagram. Peg also likes the Over app, also for iOS and Android. It takes photos and adds different fonts and overlays. For example, if you’re a coffee fan, they have coffee art. They also do seasonal updates for things like back to school or holidays. Word Swag, a popular iOS app, allows you to add your logo to photos. Word Swag looks templated because there are tons of things you can do with it, and Over looks more personalized and customized. Add text to images using Over or Word Swag (pictured). Peg also mentions a video tool called Phhhoto, which makes animated GIF videos that are perfect for Instagram. As far as scheduling is concerned, Hootsuite came out with a brand-new Instagram integration. Now, you can load images for your Instagram account into Hootsuite ahead of time. Although Hootsuite calls it “scheduling,” what it actually does is send a message to your phone telling you to post. Then you go into the app, and manually post the image to Instagram. This is great for brands that have several people posting for them. Listen to the show to discover how to find people to follow on Instagram. Katch.me is for all the diehard Meerkat and Periscope users who want more functionality from those apps, and are frustrated with some of their limitations. For example, you can’t have replays after 24 hours on certain apps and there isn’t a quick way to easily share. Katch offers solutions. Katch records your Meerkat and Periscope broadcasts and makes it easy to share them. Sign in to Katch, connect it to your Meerkat or Periscope account or both, and it will collect your broadcasts in one place with cloud storage and instant replays. It works automatically, as long as the account is hooked up. Shortly after you finish your broadcast, Katch sends out a tweet to watch the replay. 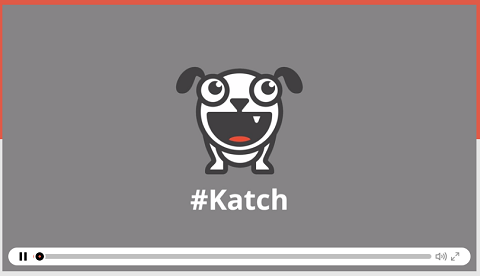 Katch is a free app. Listen to the show to learn more and let us know how Katch works for you. You’ll be led by dozens of top social media pros, including Mark Schaefer, Mari Smith, Christopher Penn, Amy Porterfield, Neal Schaffer, Ian Cleary, Viveka von Rosen, Jon Loomer, Andrea Vahl, Steve Dotto, Amy Schmittauer, Peg Fitzpatrick, Brian Fanzo, Sue Zimmerman, Kim Garst, Andy Crestodina, Pam Moore, Martin Shervington, Donna Moritz, Ron Nash, Michael Stelzner and more. We have selectively recruited the top experts on every major social network to share tactical, step-by-step, hands-on information. 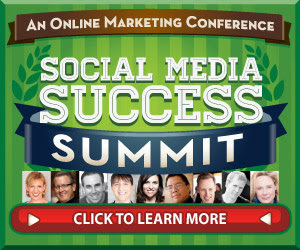 Peg Fitzpatrick is the only person speaking twice at the Social Media Success Summit. She will be doing the Instagram productivity tips panel on how to create a workflow that flows. Since there isn’t a way to schedule, you need to find a great process to create content, manage it and get it all out on Instagram. The second session is how to create a visual style for social media images. It’s on how to create brand guidelines for your blog, so when people go to your blog and see your social media, you look as professional as possible. Plus, Vincent Ng of MCNG Marketing will be presenting on how to use Pinterest analytics to grow your Pinterest reach. , Steve Dotto is talking about how to use YouTube to grow your email list and Amy Schmittauer is talking about how to create video content marketing plans with YouTube. We’re not just covering video and visual marketing, we also get into every major social network. Learn more about Peg on her blog. Follow Peg on Instagram, Pinterest, Twitter and Facebook. Read The Art of Social Media: Power Tips for Power Users. Explore Martha Stewart’s Facebook page. Check out Guy Kawasaki and Gary Vaynerchuk. Learn more about Canva, Iconosquare and Facebook Mentions. Explore Camera Awesome, Over, Word Swag and Phhhoto. Discover how to add Instagram to your Hootsuite. What do you think? What are your thoughts on Instagram? Please leave your comments below. 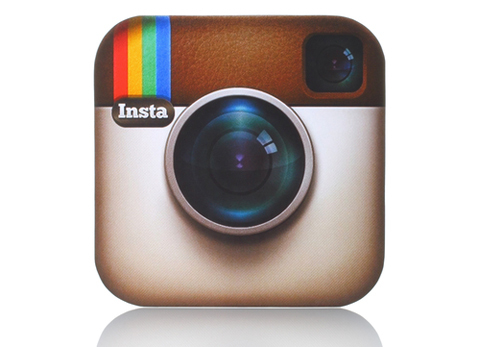 Instagram logo photo from Shutterstock. 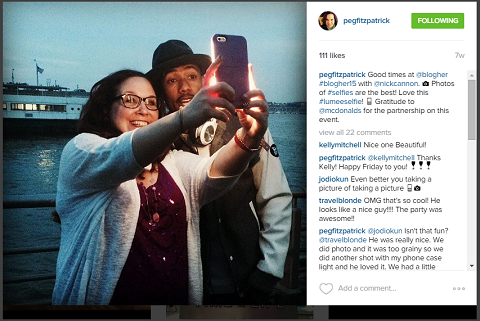 Peg Fitzpatrick talks with Michael Stelzner about how to stand out on Instagram.